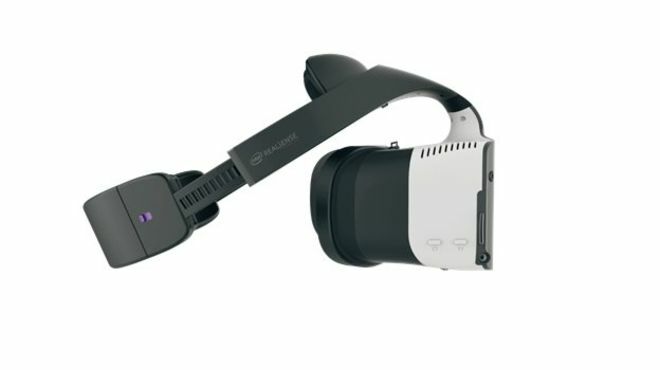 Everyone is making a virtual or augmented reality headset these days. Joining the likes of Microsoft, Sony and (possibly) Apple, Intel is currently developing a headset that uses its own RealSense depth-sensing cameras, Replay graphics-creation software and other Intel intellectual property. Revealed at its Intel’s developer conference today, the ‘merged reality’ device — dubbed ‘Project Alloy’ — has a key advantage over other headsets in that it allows users to see their own hands, and use them to interact with objects in the game. Using the headset’s RealSense cameras, the headset could detect a user’s finger movement and allow users to manipulate objects within a simulation — thus negating the need for controllers. Merged reality is about more natural ways of interacting with and manipulating virtual environments — by liberating you from the controllers and the nun chucks of today’s VR systems by immersing your hands — your real-life hands — into your simulated experiences thanks to readily available new sensing technologies. It’s also completely cordless, for better or worse. While it’s nice to avoid being jolted out of a realistic simulation once you run out of cord, the reliance on WiFi will slow the computer’s response time ever-so-slightly — which could be just enough to ruin the experience. The demonstration itself was less-than-impressive, at least according to sources in attendance. The merged reality objects only appeared as low resolution graphics and the hand-tracking Krzanich touted only works if you keep your hands near the center of a user’s field of view. Of course, this isn’t anywhere near a finished product. For now, it’s just Intel formally throwing its hat into an ever-growing ring of virtual and augmented reality players. In the mean time though, Intel can be confident that it further muddied the augmented reality waters by adding yet another brand-specific distinction — merged reality for a general public that may not know the difference between augmented and virtual reality. Now, they’ve got virtual, augmented, merged, and mixed (Microsoft) reality. You know, in case they weren’t confused enough already. Intel intends to offer the technology that drives Project Alloy to other manufacturers next year. There are no plans for a consumer release of the Intel-branded headset.